Almost exactly 2 years ago, I wrote about 3 PPC features that weren’t ready for prime time – the new (at that time) Adwords Editor, Bing Ads UET, and LinkedIn Ads. The first two features have come a long way in 2 years. The issues I talked about with Adwords Editor stopped soon after, and I finally got used to it, even though I liked the old Editor better. I’ve gotten used to its quirks, though, and now that the Bing Ads Editor has followed the same format, it’s become my everyday workflow. The developers and UI engineers at Bing Ads have gone to great lengths to make UET easier to use. The setup is much more intuitive than it was 2 years ago. It’s as easy to use as Google Analytics. As for LinkedIn Ads? Keep reading. Here are 3 PPC features that aren’t ready for prime time, the 2017 edition. LinkedIn Ads should be a no-brainer for B2B advertisers. In fact, it’s the paid social channel that our clients think of first – everyone wants to advertise in LinkedIn. The problem is, their UI is horrible. Their reporting is horrible. Their CPCs are astronomical compared to other channels like Facebook – and Facebook’s B2B targeting now rivals LinkedIn’s. I complained about LinkedIn in 2013 and again in 2015. Here it is 2017, and I’m still complaining about them. I had hoped that when Microsoft bought them, things would improve. That’s still possible – the details of the purchase are still being worked through legal. But right now, it’s a mess to use – and has been for 4 years at least. I used to like Twitter Ads. We’ve used them effectively for several clients over the years. But they haven’t kept pace with the times. The ads interface, even the new one, is clunky to use. Reporting is horrible – as bad as LinkedIn’s. Targeting on Twitter Ads is awful. Unless you know the exact Twitter handles you want to target, you’re basically shooting in the dark. Keyword targeting is a joke. There isn’t any real B2B targeting. 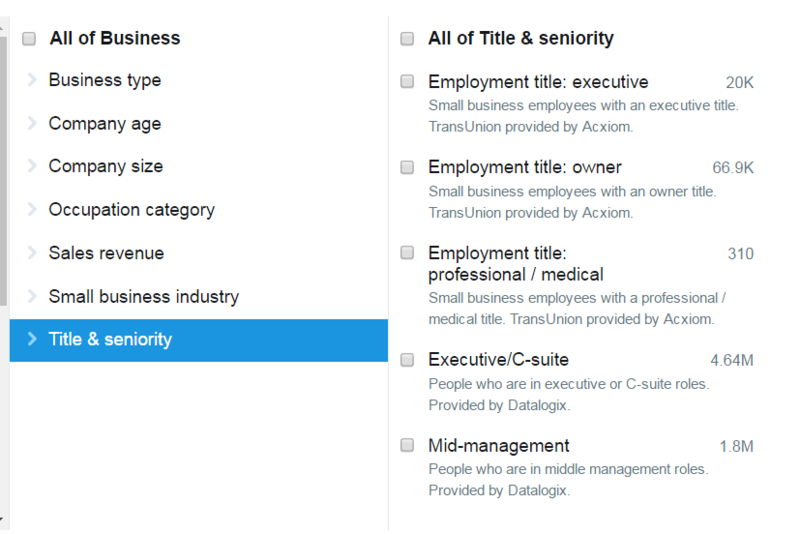 Behavior targeting is totally B2C focused, and even then is missing key categories. A whopping 2 types! Are they kidding? And what about job titles? If you’re not targeting executives or the C-suite, forget it. And these poor people are bombarded with ad messages as it is. There is so much potential here, but the limited targeting and broad reach just doesn’t work for most advertisers. On top of that, their conversion tracking tags don’t seem to work – or at least we can never get them to work. You’re relegated to tracking in GA, or not at all. Sorry, Bing Ads – I love you guys, I really do, but the remarketing program leaves a lot to be desired. At this point, only RLSA is available in Bing – retargeting visitors as they perform searches. RLSA is a high-performing, but very low volume, tactic. With Bing’s smaller audience to begin with, compared to Google, it’s hard to move the needle with RLSA on Bing for all but the largest advertisers. Also, up until a week ago, Bing Ads didn’t offer exclusions for remarketing. Sorry guys – that’s a huge miss. Just a couple weeks ago, I wrote about how not to do remarketing, and one of the no-no’s was failing to exclude those who already converted. Up until a week ago, this wasn’t possible with Bing remarketing. As I was thinking about the 2017 culprits, I realized that, in general, the search engines have gotten much better about making sure features work well before releasing them. I struggled to think of the last time an engine released a feature that was a nightmare to use. Sure, there have been boneheaded releases like automatically including phone numbers in ads, whether you want them or not, but this is an opt-out-or-you’re-stuck-with-it thing, not a feature we’re trying to actively use. So either the engines have made it easier on us, or we’re all getting more skilled. Probably a little bit of both. What PPC features have you noticed that aren’t ready for prime time? Do you agree with my list? Share in the comments!